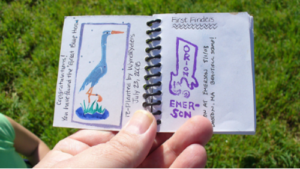 Letterboxing combines elements of orienteering, art, and puzzle solving. Letterboxers hide small, weatherproof boxes in publicly accessible places (like the Wildlands) and distribute clues to finding the box in printed catalogs, on one of several web sites, or by word of mouth. Individual letterboxes contain a notebook and a rubber stamp, preferably hand carved or custom made. Finders make an imprint of the letterbox’s stamp in their personal notebook, and leave an impression of their personal signature stamp on the letterbox’s “visitors’ book” or “logbook” — as proof of having found the box and letting other letterboxers know who has visited. Many letterboxers keep careful track of their “find count”. Remove the waterproof box. Inside there is a rubber stamp and logbook. 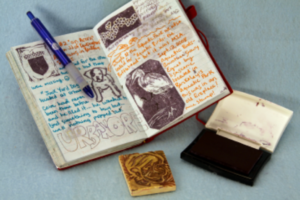 Ink the rubber stamp (with ink pad or magic marker) and press it onto a blank spot in your personal journal. In the letterbox logbook, record the date, your name (or trail name), where you are from, along with something interesting you encountered while hiking. Include your signature stamp if you have one! Please return the stamp and logbook back into bag and then into the plastic container.